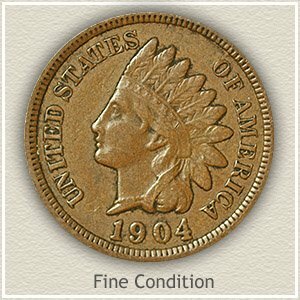 Collector demand is causing your 1879 Indian head penny value to rise. A popular series of old coins to collect, 1879 pennies are worth a good premium. Still considered part of the "early years" the surviving number of these older coins is far fewer than pennies minted in the 1880s. Contributing to their rarity are the many hazards of heavy use. Most old pennies suffer scrapes, bending, dents and lots of wear. 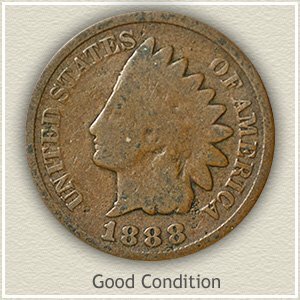 An 1879 Indian penny without these distractions is the exception and highly valued by collectors and dealers. If your coin still retains some detail in the hair curls behind her neck and above her eye, it is considered a nice collectible condition. Higher up the scale, is pictured an "Uncirculated" 1879 Indian penny, eagerly sought in this condition and value is nearing one hundred dollars. 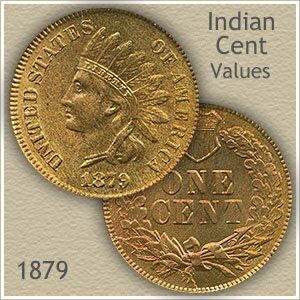 Scarcity, condition and the demand from collectors determine 1879 Indian head penny value. See the section on grading the condition of your coin, to help assign a value. A classic US coin, many collectors are assembling advanced sets of Indian pennies. Only very high quality coins are considered as additions to these sets. Some of the minimum qualities include original luster and color, and an absence of marks to the surfaces. Each coin must also have stunning eye appeal… a "presence." 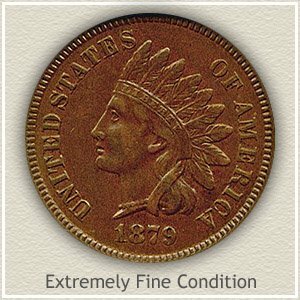 David Lawrence rare coin auction featured an 1879 Indian penny that met all the above standards. A bright mixture of red and gold highlights across the underlining luster is an impressive sight. The response from the collectors was bidding that settled on a final price of $1127. Seldom is such a coin offered, confirmed by the price. Collecting these old pennies is very popular and 1879 Indian head penny value is strong because of the demand. Your coin may have some wear to the design but it also remains a valuable part of the hobby. Small and subtle details often separate a slightly better $15 coin from a minimum value example. Key elements of the design are used to judge the extent of wear to a coin’s surface. 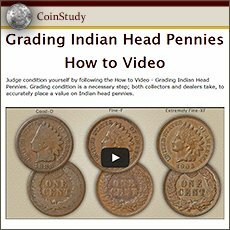 Images and descriptions uncover an accurate 1879 Indian head penny value. 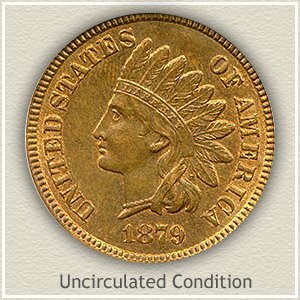 Uncirculated: Attracting the highest demand and 1879 Indian head penny value are coins that never circulated. It is very rare to find coins in the same condition as they left the mint, with no wear to their surfaces. Amazingly there are a select few known with the original bright mint luster radiating across the surface. Confirm your coin is "uncirculated" by examining the very highest points of design. The ends of the feathers and her cheek are two areas that would quickly appear dull and slightly smooth from the lightest of wear. Rotate the coin under a light, wear shows as a disruption in the luster as travels around the coin. Fine: Noticeable are parts of the hair and headband have worn to the point of merging. Feather details are missing at the ends. Her cheek no longer is rounded. Despite this moderate wear your 1879 penny still has a pleasing look. Good: If a coin has received extensive wear it is referred to as "good" condition. As your scan travels around the rim, it is important all lettering is visible. Although the portrait is very worn the bold design is clearly separate of the surface. Few details of the headdress remain, feathers are just an outline and the headband is obscured. Her facial features are very faint, the eye does have some depth and the cheek is faintly separated from her neck. If a small amount of roundness is visible to her face your 1879 Indian head penny value is slightly higher.